superdumb supervillain: Are You Inspired By Forests? Are You Inspired By Forests? So lovely. I think their nature-iffic mommy necklaces are super sweet, too. 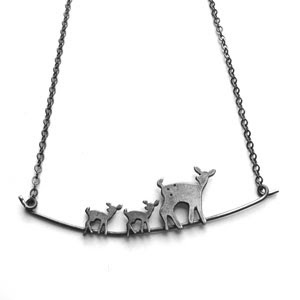 I wish someone would have gotten me the Two Fawn Family necklace or the Nesting necklace with two baby birds for Mother's Day… I guess there's always next year. Yes, all the time, I am really very inspired by forests! So cute! How exciting for that to show up in the mail. 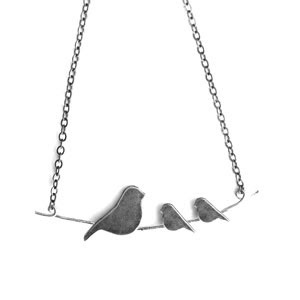 Love the little birdies necklace. Very sweet. Your necklace is very pretty and what a surprise! I agree, the mama bid and babies would have been perfect for a Mother's Day gift for you. You and your little chickadees. I love the little birdies! What a great find. They are gorgeous! I remember that contest, and I wish I had planted a tree, not just to get that swanky jewelry either!